"The QuakeHOLD! 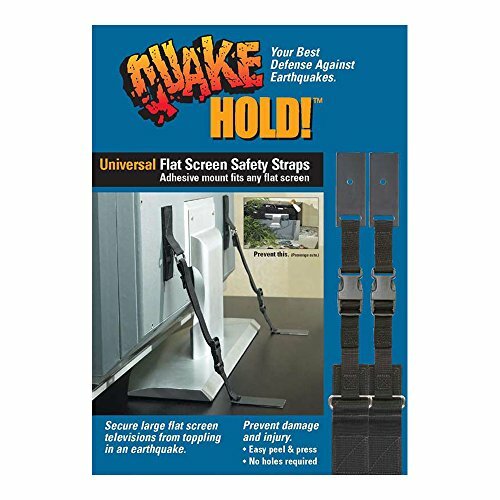 Universal Flat Screen TV Safety Strap has been developed to prevent modern LCD and Plasma flat screen TVs from toppling over, and features a ‘Contour Grip’ mount design with quick-disconnect buckles for moving and cleaning. Its superior strength, adjustable nylon straps mean no holes have to be drilled, and there’s no damage to furniture or equipment. The easy peel and press application makes installation a breeze. Straps are hidden from view. Secures large flat screen TVs up to 70” and 150 lbs. State-of-the-Art design fits all makes and models. " If you have any questions about this product by Quakehold!, contact us by completing and submitting the form below. If you are looking for a specif part number, please include it with your message.